East County residents are petitioning the State Highway Administration to name an overpass crossing the soon-to-be-completed InterCounty Connector after local civic activist Stuart Rochester, who passed away last summer. C. Patrick Zilliacus of Fairland, who with Rochester helped guide the drafting of the 1997 Fairland Master Plan, sent this letter to the SHA explaining why the bridge on Old Columbia Pike should be dedicated to him. 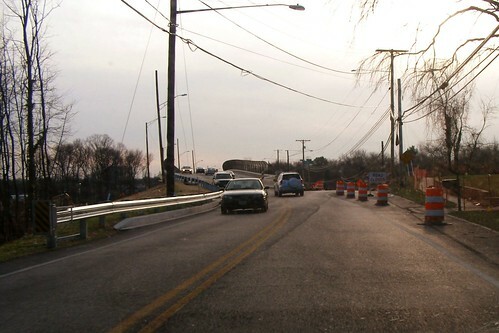 The bridge carrying Old Columbia Pike over the InterCounty Connector in December. I am a longtime resident of the Fairland Master Plan Area of eastern Montgomery County. In late July 2009, Fairland lost a good friend and tireless advocate for our community, Dr. Stuart I. Rochester, who died after a long battle with melanoma. Dr. Rochester was the chair of the Fairland Master Plan Citizens Advisory Committee (“Fairland CAC”) to the Montgomery County Planning Board of the Maryland-National Capital Park and Planning Commission from the mid-1990's, and frequently insisted that Montgomery County’s planners and government generally at the county, state and federal level adhere to adopted planning documents. This included the alignment of long-discussed Maryland Route 200, the InterCounty Connector (“ICC”). I had the privilege of serving with Dr. Rochester since 1993 on planning matters affecting Fairland as an at-large member of the Fairland CAC. I request that the Maryland Department of Transportation consider naming the recently-completed bridge that carries Old Columbia Pike over the ICC in honor and memory of Dr. Rochester with appropriate signage. I believe this is entirely appropriate, given his unending advocacy for the ICC staying on its master-planned route, and his vigorous opposition to the so-called “Northern” alignment, which was never shown on any master plan document in Montgomery County or Prince George’s County. There is compelling symbolism to naming this particular bridge in his honor, given that the eastern bound of the most controversial segment of the ICC, across the Paint Branch watershed, is near Old Columbia Pike. I have discussed this with several members of the Montgomery County Council, and the District 14 delegation to the Maryland General Assembly, and they have informally indicated their support for this suggestion. In discussing this idea with several persons, I was informed that you are the MDOT staff person to whom such matters should be directed. Thank you for your prompt consideration of this suggestion.